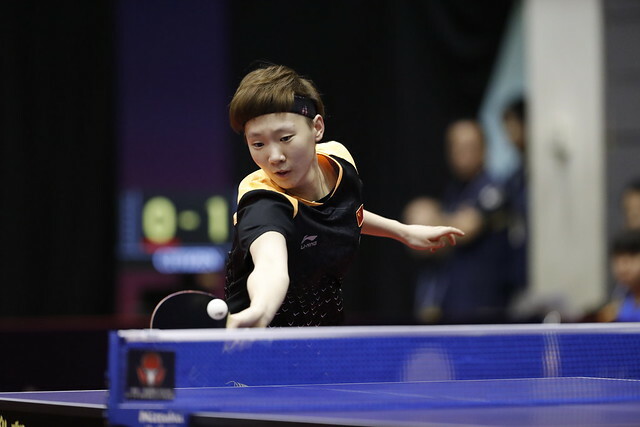 Previous success on the ITTF World Tour, on Thursday 7th June, the Chinese duo comprising Mu Zi and Hu Limei both emerged successful in the final qualification round of the Women’s Singles event that precedes the Seamaster 2018 ITTF World Tour Lion Japan Open in Kitakyushu. The winner in 2014 in Qatar, Hu Limei beat Korea’s Kim Youjin (11-5, 6-11, 11-6, 11-6, 11-7); Mu Zi, who the following year succeeded in Sweden, accounted for the latter nation’s Matilda Ekholm (11-8, 11-5, 5-11, 11-6, 11-1, 6-11, 11-8). Defeat for Matilda Ekholm by the very narrowest of margins; however, there was success for Europe as play progressed in the final qualification round of the Women’s Singles event. Romania’s Bernadette Szocs beat Japan’s 12 year old defensive player, Haruna Ojio (11-4, 10-12, 11-5, 11-6, 7-11, 11-7). A hard fought win for Bernadette Szocs, it was even harder for Britt Eerland of the Netherlands who recovered from a three games to nil deficit against Korea’s Lee Zion to secure victory (6-11, 8-11, 11-13, 11-7, 11-6, 11-8, 13-11). Success for Bernadette Szocs and Britt Eerland, it was the same for a further European in the guise of Portugal’s Fu Yu; she accounted for Korea’s Wee Yeji (11-3, 11-7, 11-6, 11-4). However, there was one notable casualty; in the all-Japanese clash Maki Shiomi experienced defeat at the hands of Satsuki Odo in a tension packed seven games contest (11-2, 11-4, 8-11, 11-13, 7-11, 11-9, 12-10). Presently on the Women’s World Rankings, Satsuki Odo is named at no.81, Maki Shiomi at no.42.